Damage to your teeth can be caused by any process that results in loss of integrity of the tooth surface. 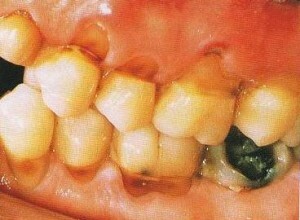 Tooth decay is a bacteria-caused form of tooth damage. The other forms of tooth damage are the result of mechanical or chemical assault to the tooth structure which may be brought about by your daily habits for example grinding in your sleep and tooth brushing. Dental attrition is wear acquired when your teeth constantly contact with each other. All tooth wear from opposing tooth contact and the wear is more prominent as we get older. The characteristic feature of dental attrition is the development of a wear facet – a flat, often shiny surface with a well-defined border. Sometimes the tips of the teeth appear darker as the inner part of the crown (dentine) is being exposed which can make your teeth sensitive. Excessive wear is disease-related and may be caused by abnormal biting, habits such as tobacco chewing, abnormal tooth structure, bruxism, teeth grinding or clenching. Bruxism is the term given to periodic repeated clenching or rhythmic forceful grinding of the sleep usually during sleep. Facial pain and a stiff jaw are symptoms that may indicate active grinding. Dental abrasion is the wearing of tooth substance caused by foreign substance. Foreign substances can include anything from sand, grit, foods as well as any solid material held or forced against the teeth. Toothbrush abrasion is commonly seen on the root surfaces of teeth. It is the result of traumatic tooth brushing in a horizontal scrubbing movement and appears as notches worn into the teeth near the gum margins which can be made worse by abrasive dentifrices. Abrasion on the biting surface of teeth is often seen on teeth that oppose porcelain crowns. It is not uncommon for pipe smokers and seamstresses to exhibit abrasion at the tips of their teeth as a result of clenching foreign objects between the front teeth. Dental erosion is the superficial loss of tooth surface as a result of chemical process, usually from non-bacterial acids. The acids that cause erosion may be from an external or internal source. Extrinsic acids may include those found in foods and drinks, for example carbonated soft drinks, fruit juices and wine. Some medications are also acidic. Gastric acids coming from the stomach are intrinsic acids. Excessive vomiting can be associated with anorexia and bulimia as when the individual strives for the ultimate thinness, the repeated vomiting of stomach acids through the mouth can cause the inner surfaces of the teeth to dissolve. A similar pattern of acid wear can be seen in those with gastric reflux, for example chronic alcoholics, where gastric reflux is probably associated with chronic gastritis. Teeth erosion also results from habits such as sucking on lemons or holding mouth fresheners, cough drops or candies in the inner cheek. The erosive action of these chemicals causes local destruction of tooth enamel. 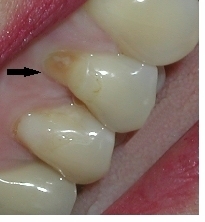 Abfraction is believed to be stress lesion on the sides of teeth that is manifested as a V- or wedge-shaped defect at the meeting point of the tooth’s crown and root. 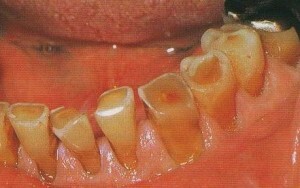 It is believed that abfraction defects are due to abnormal biting forces, which causes tooth to flex and resulting wear. Tooth fractures may range from small chips of the tooth enamel (the outer surface of the tooth) to breaks that penetrate deeply into the tooth. Sports injuries, falls and trauma can cause fractures to the teeth. Prevention requires an understanding of the cause of tooth damage. For those with bruxism, a splint or mouthguard may be useful for night wear. You may need to see a doctor or psychiatrist to resolve gastric or bulimic problems. If tooth wear is excessive, you may need full coverage crowns or bridges. 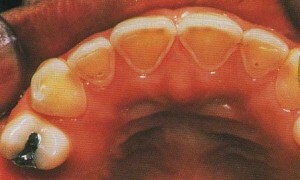 In some cases surgical lengthening of the teeth crowns may be required. Overdentures can be given in cases of excessive tooth wear but appearance-wise may be less satisfactory. Minor enamel fractures often require nothing more than polishing of the rough surfaces. More severe fractures require various levels of restoration. Some fractures teeth may not be restorable and, as a result, require removal. Orthodontic wax is your solution when braces hurt.